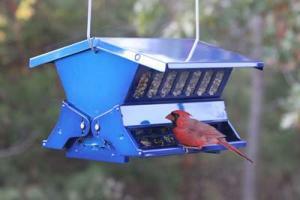 Best Price Heritage Farms Electric Blue Absolute II Bird Feeder HF7537 BEST PRICE! This is an anti squirrel deterrent bird feeder that works. It's squirrel proof,chew proof (by squirrels that is, and other critters). This solid metal design will prevent squirrels from damaging your bird feeder. The weight activated double sided perch design will allow birds to feed and squirrels to look for a new location to feed at. Pole Mounting and Hanging Hardware are Included, for Versatility. NOTE: The Absolute II above is double sided so that birds can feed from both sides. The Absolute II reviews have been very positive by most customers. 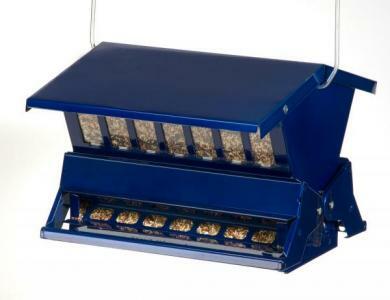 Most customers have found it to be very heavy duty because of the metal design which also prevents squirrels from chewing and damaging the feeder. Most customers have also found that they save on bird seed because squirrels cannot get to the food which means you save money and get to enjoy more birds. If I were a squirrel I would find another place to eat.